There’s a hypnotic eight-legged sea creature that fascinates marine biologists and aquarium visitors alike — the octopus. You’ll find this cephalopod mollusc in many regions of the world’s oceans. The graceful movement of the octopus is most notably found in coral reefs among a diverse array of plant life. Did you know that the octopus is one of the largest, fastest and most intelligent of all invertebrates? Explore fun facts about this species in our quiz. What do you know about this eight-legged sea creature? Is this eight-legged sea creature a vertebrate or invertebrate? Most octopuses do not have an inner or outer skeleton, shell or bones. The majority of them have soft bodies. There is one hard part of an octopus body, the beak. The beak allows the octopus to squeeze through very narrow slits between underwater rocks, which is very helpful when it is fleeing from predatory fish. Two of the hearts work solely to move blood beyond the octopus’s gills. The third heart keeps circulation flowing for the organs. This heart stops beating when the octopus swims. Does an octopus have gills? Two of an octopus’s hearts pump blood through its gills, while the third heart pumps blood to the rest of the body. An octopus has very copper-rich blood to transport oxygen throughout its body. Many studies show that some species of octopuses are intelligent. Some species are very smart and can complete complicated mazes, showing short and long-term memory depending on the type of octopus. 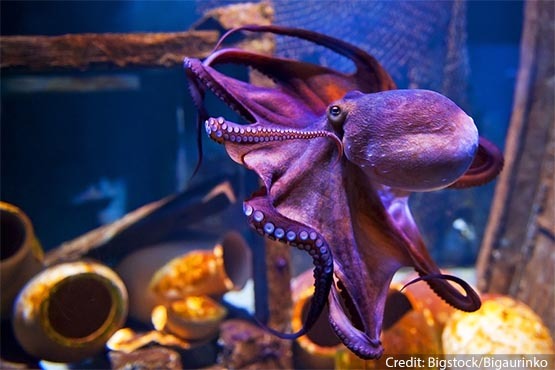 Hiding is an octopus best defense, but it has many other tricks to escape predators. Which one below is NOT one of them? An octopus’s suction cups helps it taste what it is touching and prevents the arms from getting stuck to each other. How long can a common Atlantic octopus grow to be? The common Atlantic octopus can grow to be 10 feet long and can weigh up to 22 pounds. Octopus live for long periods of time. Some octopus can live for up to five years, while others live for as little as six months. Also, if an octopus doesn’t mate, it may increases its life expectancy. Which is larger, the common Atlantic octopus or the giant Pacific octopus? The giant Pacific octopus can grow over twice the size of a common Atlantic Octopus, it can reach 23 feet in length. The giant Pacific octopus can grow over twice the size of a common Atlantic octopus. It can reach 23 feet in length. Which one of these is the most poisonus octopus? The blue-ringed octopus carries enough venom to kill over 20 adult humans within minutes. Their bites are tiny and most times painless but can result in nausea, heart failure, respiratory arrest, blindness, and paralysis within minutes if not treated immediately. 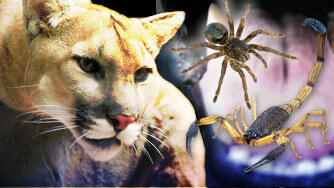 Many victims don’t realize they have been bitten until respiratory depression and paralysis begins.